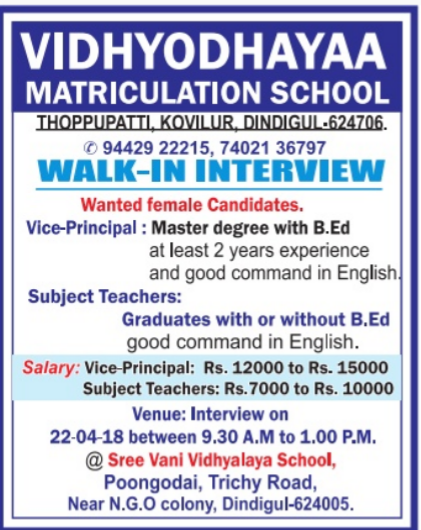 Vidhyodhayaa Matriculation School, Dindigul has advertised in THE DINAMALAR newspaper for recruitment of Vice- Principal/Subject Teachers jobs vacancies. Interested and eligible job aspirants are requested to attend interview on 22nd April 2018. Check out further more details below. 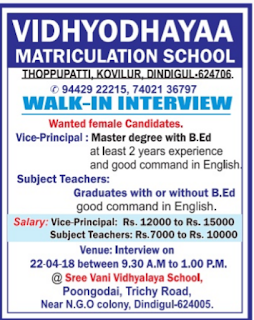 Name of the School: Vidhyodhayaa Matriculation School, Dindigul. About School: Vidhyodhaya Matric School, is located in kovilur and dindigul dt. Vice-Principal: Master degree with B.Ed. Venue: @Sree vani vidhyalaya school,Poongodai,Trichy rd,Near N.G.O colony, Dindigul-624005.